Due to an increase in the proliferation of fake and dodgy medicines and the individual and collective health risks associated with this phenomenon, drug quality control in the distribution systems of developing countries has become more and more important for consumer protection today. According to the latest research from the World Health Organization (WHO), 1 in 10 medical products circulating in developing countries is either substandard or falsified. Under these circumstances, a greater number of samples have to be tested in order to maintain an appropriate assurance of drug quality and a high level of patient protection. Yet at the same time, pharmacopoeial analyses have become more and more expensive and only a few centers of excellence in some countries are currently available to perform them in the quantities required. In order to bridge the capacity gap in regular drug quality monitoring on national level in low-income countries and in order to overcome limited access to regular drug quality testing of public, private and faith-based drug supplies, the Global Pharma Health Fund (GPHF) set out to develop and supply inexpensive field test kits with simple test methods for rapid drug quality verification and counterfeit medicines detection. The GPHF-Minilab takes the basic drug testing scheme published by the World Health Organization (WHO) some thirty years ago into the 21st century. New test methods have been introduced, and supplied are not only operation manuals printed in different languages, but also a complete range of lab ware, starter kit chemicals and reference standards is included - all suitably packed for global shipment by air. Now, identification of counterfeit medicines containing wrong, too little, or no ingredients at all can be performed instantly anywhere in the world. Results obtained by a set of physical and chemical screening tests must match the product label claims for, at least, drug identity and content. If they do not match or results are inconclusive, then the appropriate batches can be frozen for further investigation in a fully-fledged lab. GPHF-Minilabs contain the essential lab ware and chemicals, as well as secondary standards for reference purposes. Supplies include sufficient quantities in order to perform about 1000 assays while ensuring that the total material costs for one test run do not exceed two Euros. 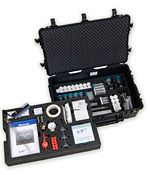 A heavy-duty suitcase contains the essential components - a full range of glassware for sample extraction, preparation, pipetting and spotting, high performance chromatographic plates, developing and detection chambers, electronic pocket balance, UV lamps with different wavelengths, a hot plate and calliper rules. Even pens and pencils are included. Of particular importance is a full collection of secondary reference standards for currently 90 active ingredients and a set of manuals providing simple operation procedures. Written in a non-scientific format and rich in illustrations, the manuals read more like a cooking recipe than an instruction booklet. They are also available in French and Spanish. Priority disease programs frequently use GPHF-Minilabs to monitor the quality of essential medicines in malaria-, TB- and AIDS-endemic countries. Multilateral support comes from the United Nations family (UNICEF, UNODC, RBM) and the Global Fund (AMFm); bilateral support in most cases from the United States Agency for International Development (USAID) and its implementation partners, the USP Promoting the Quality of Medicines programme (PQM)and the MSH Partnerships for Supply Chain Management (PFSCM). Together with IMPACT, Interpol and national enforcement bodies, joint drug quality monitoring projects run in South East Asia and Africa triggered off the seizure of millions of counterfeit antimalarial pills without any active principles in the recent years. Additional Minilab project support comes from bilateral development programmes in Great Britain (MeTA, PATHS2), Switzerland (SCIH), Belgium (BTC) and Germany (GIZ). Faith-based and private non-governmental organisations , for example CordAid in the Netherlands, Action Damien in Belgium and some others in Germany (DIFÄM, MMI, Action Medeor, German Doctors) partly complement the engagement of public institutions to combat counterfeit medicines and are employing GPHF-Minilabs for due diligent drug quality control within their Ecumenical Pharmaceutical Network (EPN) for own health services and partner hospitals as beneficiaries. Other Minilab users are, for example, public drug procurement agencies and faith-based drug supply organisations in Nicaragua and Bolivia, medicines regulation authorities in Indonesia and Papua New Guinea, consumer protection institutions in India and Pakistan, diocesan hospitals in Ghana and Cameroon, scientific societies and business institutions in Laos and Thailand as well as the Bill and Melinda Gates Foundation (BMGF) in cooperation with the London School of Hygiene and Tropical Medicine (LSHTM) for rolling back malaria projects in East Africa. Overall, more than 800 Minilabs have been supplied across 97 countries out of which Cambodia, Laos, Vietnam, Myanmar and Tanzania adopted the technology for post-marketing antimalarial drug quality monitoring already.